After watching a 20-point lead dwindle down to just six, Syracuse was able to finally put away the Eagles. Saturday afternoon at the Carrier Dome provided both the best and the worst of the Syracuse Orange. The Orange ultimately took down the visiting Boston College Eagles, 67-56, but it wasn’t an easy task. Or it wasn’t as an of a task as it probably could have been. Actually, for a stretch in the second half it looked like Syracuse (17-7, 8-3) was in fact going to cruise to a comfortable home victory. An alleyoop finished off by Tyus Battle gave SU its 25th point off of a Boston College turnover, and it helped give SU what would become a commanding 60-40 lead. Freshman Buddy Boeheim carried the load from the outside, hitting 4 of his 5 three-point attempts, and Battle came up with 16 of his own in the final 20 minutes of the contest. At that moment, it looked like the route was on. Then the wheels came off a bit as the Eagles (11-11, 2-8 went on a 14-zip run of their own to whittle the deficit to just six. Ky Bowman hit big shot after big shot, as the junior guard who started the game on the bench tallied 21 points (essentially his average against Syracuse over the last four games). 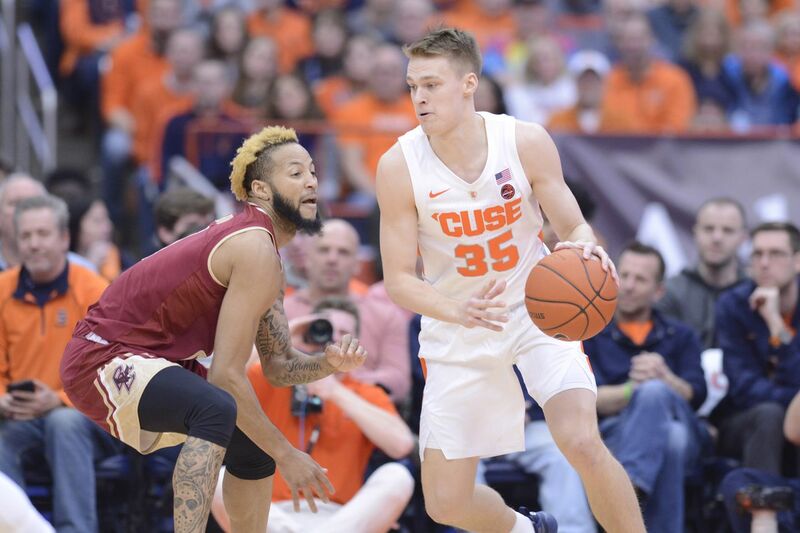 For about a five to seven-minute period in the second, Syracuse’s zone struggled to find or stay with shooters and offensively, the Orange bogged down with the ball. Classic Good Cop/Bad Cop, but so far this season it appears to be Focused SU vs. Not-That-Into-It SU. Surprisingly, Boston College’s late movement against Not-That-Into-It SU came without Nik Popovic. The junior forward left the game with an apparent head injury after colliding with Paschal Chukwu about three minutes into the second half. At the time, BC was trailing 36-26, with absolutely nothing working. Luckily for the Orange, Boston College ran out of gas while trying to dig itself out of the hole. Syracuse hit enough free throws as BC cooled off, walking out with the 11-point win. The victory secured a season sweep of BC—this is the first time SU has swept both the Eagles and Pittsburgh Panthers since joining the ACC. Before the game got dicey, Buddy Boeheim was Buddy Buckets. The coach’s son scored 16 points for the game, 11 alone in the first half—the only player from either team to reach double figures before intermission. Battle also flashed forms of James Harden, running point while also setting up his own shots. The junior missed his only two three-point attempts but was 8 of 13 from the field for the game, and also grabbed four boards. While Buddy carried most of the load in the first, it was Battle who took over in the second. Syracuse is next in action on Wednesday night at NC State. The Orange begins a touch stretch that starts in Raleigh and then includes match-ups with Louisville, Duke and North Carolina. It better be paying attention or things could get ugly these two weeks.